Several countries are joining forces to explore the solar system, and international cooperation in this area is set to grow. Russian instruments installed on American rovers are already looking for traces of both life on Mars and water on the Moon. In late November, the European Space Agency Council approved a draft agreement with Roscosmos on the ExoMars mission to the Red Planet. 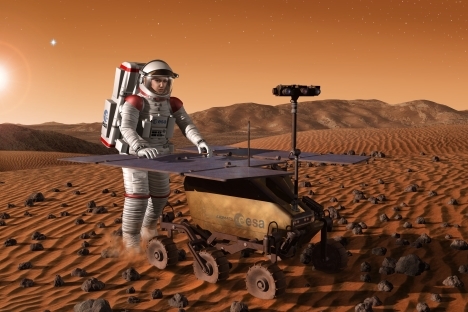 The mission’s key objective is to look for signs of life on Mars. Under the draft agreement, European specialists will create a TGO (Trace Gas Orbiter). One of the TGO’s main tasks after its projected 2018 launch will be to investigate gasses that are present in low concentrations in the Martian atmosphere. Europeans will develop an Entry, Descent and Landing Demonstrator Module (EDM), while Russian scientists will create scientific instruments for the orbiter. Russia will also provide a Proton-M launcher and the Baikonur Cosmodrome, from which the orbiter will be launched. If everything goes according to plan, a Proton carrying the Martian orbiter could blast off in 2016. It is worth noting that Russia has accumulated considerable expertise in providing scientific equipment for international space projects. NASA’s Mars rover Curiosity, for example, could well be described as a Russian-American program; it carries 10 scientific instruments weighing 165 pounds, part of which is made up of Russian equipment. “The surface of Mars is covered with dust brought by global dust storms," Yuri Zaitsev, Russian Academy of Sciences Space Research Institute spokesperson, said in an exclusive interview with RBTH, "So, in order to search for the most interesting area for researching minerals and biomarkers, a ‘look’ through the layer of dust is first needed. The Russian instrument DAN, developed by the Space Research Institute’s Laboratory for Space Gamma-Spectroscopy, should help solve this problem." Related: No more interest in work on ISS? The DAN’s predecessor – the Hand device that was also created at the Space Research Institute – spent 10 years working onboard the American satellite Mars Odyssey. The Hand operated on the same principle as the DAN. But Mars is not the only destination… Launched in the fall of 2009, the American Lunar Reconnaissance Orbiter (LRO) recently confirmed the existence of water on the Moon. Once again, it was a Russian instrument – the LEND, short for Lunar Exploration Neutron Detector – that was credited with the discovery. According to Igor Mitrofanov, a Space Research Institute laboratory head, the largest amount of water was discovered at the southern pole of the Moon. The very fact that water is present on the Moon could rather substantially change the course of further planetary research. “We have found up to 10 percent of water in the Moon’s soil, and evaporating it from there will not be a problem,” Mokrousov said. “Why are we doing this? This is necessary for exploration of Mars, which is more like Earth." "Of course, it’s colder there and the atmosphere is different, but we will correct that: The Earth has an atmosphere because it has life, not the other way around," he added. "So if similar microorganisms are planted on Mars, it will have an atmosphere too. If we hadn’t found anything on the Moon, we would have had to go straight to Mars, and there would be no intermediate stopover point. But it takes nine months to get there, and all possible situations must be taken into account." In the immediate future, Russia is likely to continue taking part in international programs aimed at looking for life and water in the solar system. A large-scale Russian-European Moon exploration project with the Luna-Resurs and Luna-Glob orbiters is scheduled to start in three months. “As far as we know, Roscosmos is getting ready for a large-scale mission to explore the Moon’s surface. Europe – and Germany in particular – is very interested in participating in this promising project,” said Johann-Dietrich Wörner, chairman of the executive board at the German Aerospace Center.